A day after being crowned Champion 2YO Sire in France, Vinery shuttler Myboycharlie (Ire) has unearthed another potential star in New Zealand. His lightly-raced 3yo Charles Road will be winning much better races after a barnstorming breakthrough over a mile at Tauranga on Monday. Set alight by Craig Grylls approaching the home turn, he gave O’Angel a hip-and-shoulder at the furlong before bolting in by next to four lengths. Charles Road (3g Myboycharlie – Giant Mystique by Giant’s Causeway) is trained by Lance O’Sullivan & Andrew Scott and started an odds-favourite after unlucky placings at his first two starts late last year. “He’s still a work in progress and we were really pleased with the win,” O’Sullivan said on Tuesday morning. “He’s pulled up really well but we will tread carefully. He’s a nice horse although it was plain to see yesterday that he’s still as green as grass. Charles Road was a $90,000 buy for David and Diane Archer at the 2015 NZB Karaka yearling sale. His dam is an unraced half-sister to Singapore’s Group 1 champion War Affair (O’Reilly). 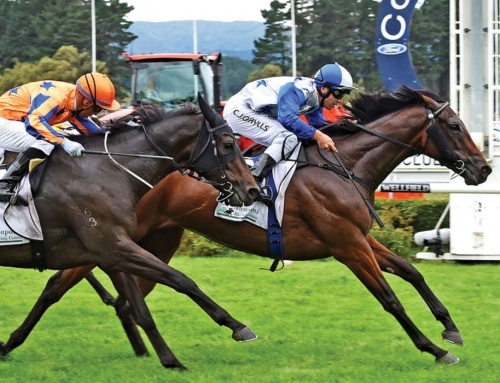 Myboycharlie filly Florence Hill also holds nominations for the Kiwi classics in March. She won at Ruakaka on debut and is recovering from some shoulder soreness before resuming full work with trainer Richard Collett. Watch Charles Road win here.